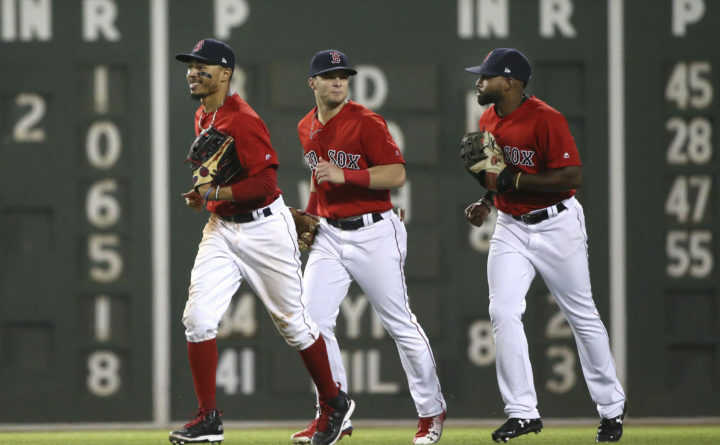 Boston Red Sox outfielders, from left to right, Mookie Betts, Andrew Benintendi and Jackie Bradley Jr. run off the field after their victory in an interleague game against the Atlanta Braves at Fenway Park in Boston on Friday night. BOSTON — Mookie Betts hit his major-league leading 17th home run, J.D. Martinez slugged his 16th homer and the Boston Red Sox beat the Atlanta Braves 6-2 on Friday night hours after a surprising roster shakeup. Boston got its fifth win in six games shortly after announcing it had designated Hanley Ramirez for assignment. The move freed up a roster spot for Dustin Pedroia to be activated from the DL, and also created the chance for regular playing time at first base for Mitch Moreland, who had a solo homer in the eighth. The Red Sox fared fine without Ramirez, the struggling slugger they signed to an $88 million, four-year deal before the 2015 season. Xander Bogaerts also had a solo homer as Boston converted big time on its seven hits. Eduardo Rodriguez struggled early but managed to hold Atlanta to just a pair of runs on six hits with three walks in 5 2/3 innings. Rodriguez (5-1) struck out seven despite his early control issues and walked three. Nick Markakis hit a two-run double for the Braves, who have lost three of four. Julio Teheran (4-2) pitched six innings, allowing three runs on four hits, walking three and striking out four. Martinez pulled Boston within 2-1 with a leadoff homer in fourth on a line drive that clipped the top of the Green Monster. Bogaerts tied it two batters later on a solo shot that left the ballpark entirely. Boston took its first lead in the fifth when Jackie Bradley Jr. tripled to center with one out and scored on Andrew Benintendi’s sacrifice fly. Rodriguez appeared headed for a short night when he allowed two or more baserunners in each of the first three innings. Atlanta scored twice in the third when Ronald Acuna Jr. and Freddie Freeman started the inning with back-to-back singles and Markakis drove in both with a double to left. Betts’ and Moreland’s homers came off of reliever Matt Wisler. TRAINER’S ROOM: Braves: Placed LHP Luiz Gohara on the bereavement list, allowing him to return to Brazil to spend time with his mother as she recovers from heart surgery. … Atlanta recalled RHP Matt Wisler from Triple-A Gwinnett. Red Sox: Activated second baseman Pedroia (offseason knee surgery), but did not start him. Dave Dombrowski, president of baseball operations, said the Red Sox are going to let the four-time All-Star and 2008 AL MVP ease back into the lineup, likely starting Saturday. “He feels good. He’s not having any pain so we think that he’ll be fine to go out there but we are going to be careful in that regard,” Dombrowski said. UP NEXT: Braves: A rookie who grew up in Massachusetts, Sean Newcomb (5-1, 1.29 ERA) is 4-0 with a 0.36 ERA in four starts this month and is making his first appearance against the Red Sox. The Middleboro High School alum had a stretch of 21 consecutive scoreless innings before the Miami Marlins scored one on him in the second last Saturday in Atlanta’s 8-1 win. Red Sox: LHP Drew Pomeranz (1-2, 5.97) lasted only four innings against Baltimore on May 18, allowing five runs — four earned — on seven hits while striking out a season-low two.